Past the chapel the path resumed. The photo included in the last post looks back at the chapel from the path beyond. Soon there were many criss-crossing paths leading toward the final beach, the isthmus, the carved face of Aeolus, our destination just a half mile ahead. 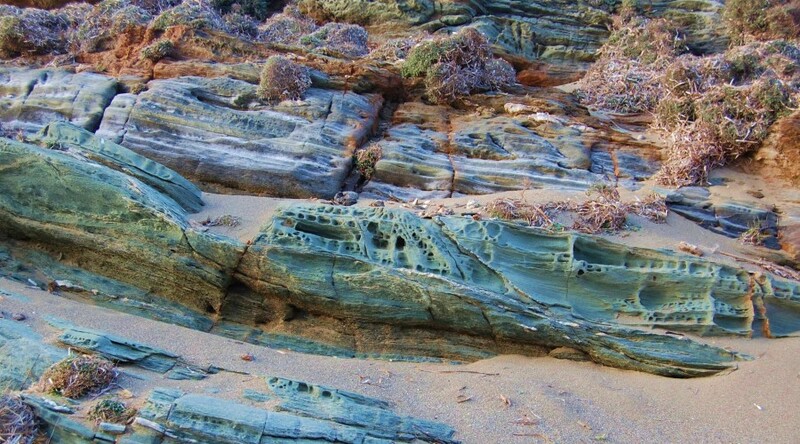 Then some remarkable formations of green striated marble rising several feet tall, reaching down toward the sea like giant chunks of stretched green taffy (the green ranging from a dark and dusky verdi to a brightly polished jade, and carved by nature into odd reticulated shapes very like the work of H. R. Giger), just stopped us in our tracks. The polished marble was impossible to resist touching, sitting on, sliding along, viewing from all angles, It was difficult to imagine these shapes so much as natural rock as, say, remnants of some nameless leviathan once transformed by Medusa's gaze, and now almost completely buried by the sand.